Organizations that are adopting agile often look for ways to establish self-organized teams where team members are able to take more responsibility. Agile software development teams could improve their decision making by using the consent principle and sociocratic procedures says Pieter van der Meché, Director Division North and Eastern Europe at The Sociocracy Group. Sociocratic governance structures can also be used to scale up agile principles to every level of the organization. At the OOP 2015 conference van der Meché talked about sociocracy: a new governance model for more commitment, better decisions and greater agility. InfoQ interviewed van der Meché about sociocracy and the concept of consent in decision making, how sociocracy support learning in organizations, examples of organizations that use sociocracy and using ideas from sociocracy for agile software development. InfoQ: Can you briefly describe sociocracy for the InfoQ readers? van der Meché: Sociocracy is a governance model based on equivalence in decision making that enables to make better decisions, create full commitment to their implementation, scale up agile principles to a whole organization and improve the communication and cooperation in and between all parts of an organization. It provides the instruments to add a circular decision making structure for policy making to an existing linear structure for the execution of that policy. This circular decision making structure is based on equivalence in decision making and co-responsibility for all organizational members to set and achieve organizational goals. The sociocratic structure is built up of circles which correspond to the functional units of the organization. So teams form a circle and make policy for their team. If multiple teams form a department also at the department level a circle exists that sets the policy at the department level. The same for the organizational level. Members of each circle are the leadership of that level, its executives and representatives from the next lower level. F.e. at the department circle one will find the manager of the department, the team leaders and a chosen representative of each team. Each circle has its own decision making domain for which it sets the policy and delegate its execution to its members. The name circle comes from the cybernetic notion of the circle process of leading-doing-measuring. Each circle is responsible to organize for the circle processes needed at that level. Cybernetic principles are at the core of the sociocratic decision making structure. They are the reason for introducing the chosen representative as a bottom up feedback mechanism and the consent principle as means to secure the circle process at each level through the equivalence in decision making of the three functions of leading, doing and measuring. InfoQ: Sociocracy uses the concept of consent in decision making. How does this work? van der Meché: One of the sociocratic decision making principles is that consent governs decision making. This tool can help agile teams to smoothen the decision making process and increase its quality. Consent means that a decision is taken when there is no paramount argued objection against that decision in the circle. A circle is a group or functional unit that shares a common goal. F.e. a project team, a department or management team. Consent helps a group improve because if participants do have paramount objections they are invited to share their objections and the reasons or broader information behind them. These can then be used to stimulate the discussion within the group and improve the decision together. Thus consent is not a veto which is just a simple no. Consent is also efficient since it leaves room for objections. It does not need a 100% agreement like consensus. As long as these objections are not that paramount that they block the person’s willingness and ability to execute the decision, consent can be given. Another aspect that makes consent decision making efficient is that it allows any other decision making principle to be used as long as it has the consent of the group. So groups can f.e. delegate decision making to some members in order to speed up decision making. InfoQ: How does sociocracy support learning in organizations? van der Meché: One aspect has already been mentioned, consent decision making focuses on reasoning to come to a decision. Since the consent of all participants is needed it involves every group member in the discussion and the reasoning to come to a decision. All minds are put to work in a creative process to generate a workable decision for the group. This boosts learning. Another aspect that enhances learning between parts of an organization or between groups in a larger project is the sociocratic principle of the double link. Many organizations nowadays use a single link, according to Likert’s linking pin theory. It means that only the leadership of f.e. a department participates in the decision making of the management team of the organization. This is not enough to secure bottom up communication, influence and commitment. Which is reflected in a distrust of higher level management and a slow or bad implementation of decisions. That is why in sociocracy a chosen representative is added. The representative is chosen in his own circle and participates on the basis of consent in the decision making of the next higher circle. His job is to make sure that the information and reasoning of his or her own circle is taken into account in the decision making at the next higher level. He or she provides for the bottom up steering or communication that feeds the decision making at the next higher level with information from the shop floor or executional level. This enhances the quality of the decisions and their acceptance by the lower circles. It does not compromise the leadership, who is still in charge to lead the implementation of the decisions in his own circle. InfoQ: Do you have some examples of organizations that use sociocracy? How did they apply it, and what did they gain? van der Meché: Fabrique, a leading design, branding and communication agency in The Netherlands does apply sociocracy for over ten years now. On what is has brought the company Paul Stork one its directors says "where as in games simple rules make for a complex and innovative play, the sociocratic construction rules produce an innovative and dynamic organization". Their good experiences with sociocracy as a decision making structure for the whole company has led them the embrace agile as their software development tool since the two have a lot in common. Like Agile, Sociocracy is based on systems theory but applied to decision making. Het Buitenschoolse Net is yet another Dutch company using sociocracy. With sociocracy they experience very high levels of worker commitment, 87% percent of the workforce claims to be above average committed to the company. Which pays out also in a very good economic performance in a competitive environment. Besides these organizations there are about 200-300 organizations using sociocracy world wide, of which a large part are bases in The Netherlands. Case examples of its added value are numerous. For example the electro technical company that survived a deep economical crises with it. Due to the double link an innovative solution generated at the shop floor level could reach decision making in the top circle which is at the apex of the organization. It led to an increase in orders and reduced the number employees that were laid off to only a handful. Another example provides an German organization producing laser equipment which gained a 15 to 20 percent efficiency in their production by implementing sociocracy. Improved efficiency and quality of meetings. InfoQ: How do you think that ideas from sociocracy can be used for agile software development? van der Meché: Agile software development teams could improve their decision making by using the consent principle and the sociocratic procedures to achieve consent decisions. These procedures contain rounds for picture- and opinion forming and decision making. The explicit use of consent can increase the quality of decisions and commitment of team members. Also the possibility to distinguish policy from execution could be beneficial. Policy decisions could focus on improvement of the development process, its overall goals and the distribution of tasks. These issues are discussed during special policy meetings that are held once every four to eight weeks. They could be the place to reflect upon the functioning of the team and how to improve it. But the biggest opportunity lies in scaling up agile principles to larger projects with multiple teams or to a whole organization. By adding a sociocratic circle structure the normal "cascade" like decision making structure transforms into a dynamic-circular one. In this structure top down and bottom up decision making are integrated and decide on the basis of equivalence on the improvement of their circle processes. Possible Circle Structure of a large project with multiple Scrum Teams. The green and blue arrows represent resp. the representative and the leadership of the lower circle towards the next higher circle. I think this is a great idea. I do have experience with both Scrum and Sociocracy but in separate environments. I also think it could help in Scaling Agile as an addition to the Scaling Agile approaches like LeSS, DAD, SAFe and not just as Scaling Agile approach in itself. Head over to sociocracy30.org, we have some resources about "classic" Sociocracy, and a new version, Sociocracy 3.0, which has been designed with agile and lean in mind. 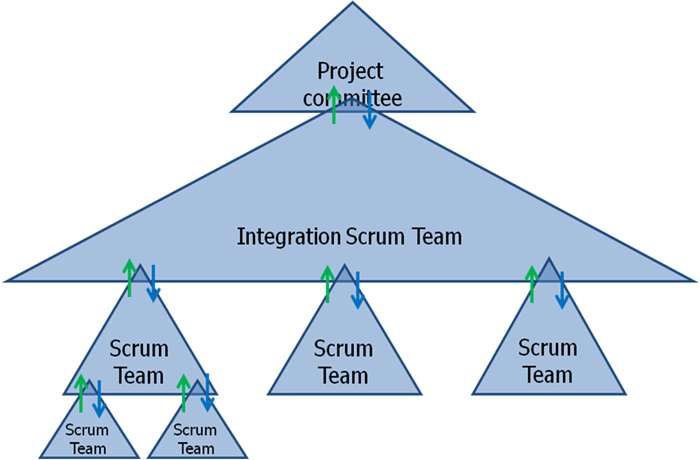 Guides for integration with Scrum (and scaling Scrum) are in progress and will be available soon. Visit our workshop on the XP2015 conference in Helsinki. Sociocracy: A Key Factor for Making Your Whole Organization Agile is held in the Executive and Managers track on the 27th of May. See www.xp2015.org/program/.